The new policy for e-learning will be used to review all Moodle courses at UCL. The E-Learning Baseline sets out the minimum expectations for e-learning provision for all taught programmes and modules, with a focus on Moodle. It offers straightforward guidance in a checklist format to help staff ensure that Moodle courses are consistent, clearly laid out and meet statutory requirements for accessible and easily navigable content. Widely recommended as ‘best practice’ across UCL since 2011, the Baseline has now been approved by Education Committee as policy and has been added to the Academic Manual. Through the policy, the e-learning presence for every taught module will be reviewed against the Baseline in 2017/18. The review will be repeated every three years, although modules that fail to meet the Baseline, or are new or substantially revised, will need to be re-evaluated the following year. The policy includes, as an addition to the current Baseline, the principle that appropriate lecture materials should be made available 48 hours ahead of class. Heads of Department/Division/Institute will be responsible for monitoring and reporting on overall performance against Baseline at a departmental level. Academic leads (programme and module leaders) will be responsible for providing the Heads of Department with data from the individual module reviews. An online checklist tool for reviewing modules will be in place to make the process as simple as possible for module leads, and reports will be available at departmental level. departmental training events by arrangement. Please contact digi-ed@ucl.ac.uk to discuss. More information about the implementation framework and processes across UCL will be disseminated early in 2018. 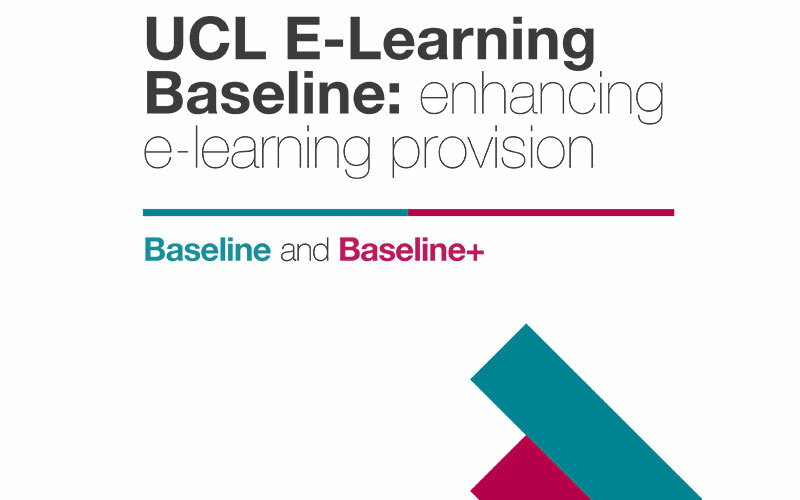 The E-Learning Baseline is now part of UCL policy and added to the Academic Manual. Further information and support for reviews will be released early 2018.